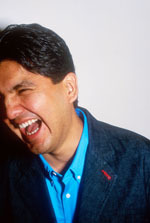 As noted by Kassia Kroszer and others, Sherman Alexie recently expressed some controversial remarks in relation to the eReader. At a BookExpo panel, Alexie called the Amazon Kindle “elitist” and said that he wanted to hit a woman sitting on a plane who was using a Kindle on her flight to New York. Now since I’m a man known to make extraordinary statements myself, I recognized Alexie’s pugilistic promise as the conversational theater he intended. Nevertheless, I was baffled by Alexie’s position. So I took it upon myself to contact Alexie to figure out where the guy was coming from. I didn’t believe the boilerplate message on his website was enough. Alexie was very gracious to respond to my questions. I consider the Kindle elitist because it’s too expensive. I also consider it elitist because, right now, one company is making all the rules. I am also worried about Jeff Bezos’ comments about wanting to change the way we read books. That’s rather imperial. Having grown up poor, I’m also highly aware that there’s always a massive technology gap between rich and poor kids. I haven’t yet heard what Amazon plans to do about this potential technology gap. And that’s a vital question considering that Bezos wants to change the way we read books. How does he plan to change the way that poor kids read books? How does he plan to make sure that poor kids have access to the technology? Poor kids all over the country don’t have access to current textbooks, so will they have access to Kindle? Have you ever used a Kindle? What has been your experience? I’ve played with a Kindle. Didn’t emotionally connect with it like I immediately did with my iPod. That’s been the fascinating thing for me. I’m not even remotely a Luddite. I love all of my tech toys (and I love Amazon.com), but I have a visceral negative reaction to eBooks. I recognize that it is partly irrational and that’s why it was easy to be influenced by some of the powerful letters of dissent I read from Kindle lovers. Several eReaders were introduced at BEA with a $249 price point. If your objections to the Kindle involve price point, would you consider the Kindle (or any eReader) to be elitist if everybody could afford it? Is there an ideal price point? Capitalism decides that. But I do want to know about Amazon’s social commitments to literacy and other social issues. If eBooks do take over the market, then dozens more independent bookstores will close, and all sorts of communities will lose a vital social force. Does Amazon have any plans to fill the social gaps left by those closed stores? If more people wanted to read your books in digital form than in print form, would you still refuse to make your books available in digital? Why? I have to make my books available electronically. I have held out on the matter for as long as possible, but I have no author allies in this fight, so I have to submit. I have to sign contracts for eBook rights. I’m doing this in the blind because none of us know what’s going to happen. The last screenwriters’ strike in Hollywood was largely the result of this same issue. The legal issues regarding the Internet and copyrights and revenue are still unclear. And I don’t think I’m so crazy to worry that large corporations may not have my best interests in mind when they are offering me deals. I guess this is the thing that amazes me most. I am taking a very tiny stand against many large corporations. I am asking what I think are serious, tough questions and all sorts of people are vilifying me for it. When it comes to this, many people are taking the side of massive corporations over one writer trying to get answers. They’re treating me like I’m Goliath. It reminds me of the way people think of professional athletes and their salaries. All sorts of middle-class folks agree with the billionaire owners of sports teams that the millionaire players make too much money. Isn’t it reverse elitism to be against those who use eReaders? And I’m not against eBook readers. I’m worried about the eBook’s influence on the whole culture. And while I certainly insulted Kindle lovers, I meant to tease and razz the Kindle itself. I meant to razz Amazon. What makes a digital copy of your book any different from a book on tape? Surely, a recorded version of your book is just as much of a corruptible form. I am in control of my audio books. And, as you will notice, I have only done three audio books, and have not been happy with that process, either, for various reasons. But when it comes to subrights, it seems that the farther one gets from the original writer and publisher, the more likely it is that the subrights licenser thinks of the books as product and not as art. The author of the original work becomes less and less important. And at every step off the way, the original artist makes far less money and has far less power than any of the companies profiting from the work. In what manner are you embracing digital media? What is your present familiarity with technology? Can you say anything positive about e-books? I love my iPod, my cell phone, my computer, and my HDTV. I have and enjoy a strong Internet presence with a great website and I have published poems and stories all over the web. In fact, I just published a poem that’s in the current online and print versions of the New Yorker. People are eager to portray me as being anti-technology, but that’s not the case at all. I think the iPod is as vital as the fork and wheel. So I’m not even sure why I have this strange, subterranean fear and loathing of the Kindle and its kind. I think it’s really about childhood. Books saved my life, Edward. I rose out of poverty and incredible social dysfunction because of books. And all of my senses-sight, hearing, touch, smell, and taste-come into play when I think and read about books. Books are tactile and eccentric. An eBook will always be a gorgeous but anonymous box. It will also be just a tool–perhaps an amazing and useful tool-but I don’t want it to replace the book. And I’m worried that many people don’t care about the book itself, and see the eBook as a replacement. And I’m worried that Amazon and other eBook distributors will completely replace bookstores. The careers of nearly every successful writer are based on the amazing human interaction between bookstore employees and readers. I enjoy an amazing career because, over the last seventeen years, bookstore employees, librarians, and book lovers have handed a copy of my book to another person and said, “You have to read this.” That face-to-face interaction will become more and more rare. Sure, the Internet can launch careers, but there is a loss of intimacy that should be acknowledged and mourned.